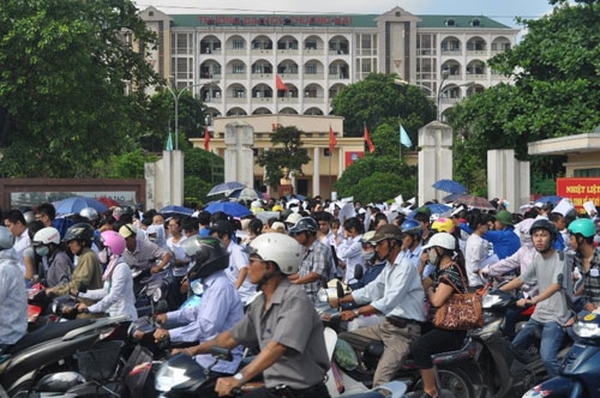 HÀ NỘI — Municipal authorities began planning to move universities from Hà Nội’s inner districts to the suburbs about 20 years ago but up to now, few university relocation projects have been carried out and none are complete. Đào Ngọc Nghiêm, vice chairman of Hà Nội Urban Planning and Development Association, said when a master development plan for the city was approved in 1998, authorities proposed relocating universities out of inner districts to reduce pressure on infrastructure, especially transport infrastructure. However, in the last two decades, no university zone had been formed, a major problem hindering the relocation projects, Nghiêm said. In 2011, Hà Nội People’s Committee planned to move 12 universities out of the city centre. The universities including Trade Union, Hà Nội Law, Foreign Trade, Construction, Hà Nội Medical University and Hà Nội Open University were expected to move to satellite urban areas like Gia Lâm, Sóc Sơn, Sơn Tây and Hoà Lạc. Việt Nam National University-Hà Nội based in Cầu Giấy District in 2003 started a project to relocate the university to Hoà Lạc area, the suburban district of Thạch Thất. The project was approved by Government with estimated investment of VNĐ7.32 trillion, however, only a few housing blocks and a dorm for 2,000 students have been built. Nguyễn Đức Đăng, director of the university’s Development Centre in Hoà Lạc said the university faced difficulties in ensuring funding for the project. Meanwhile, the Water Resource University is reluctant to send students to its branch in Phố Hiến University Zone in the northern province of Hưng Yên, despite the 50-ha branch being completed with two lecture hall blocks, a canteen, three dorms and a stadium. The provincial People’s Committee blames the lack of infrastructure on a funding shortage. Rector of Hà Nội Open University Trương Tiến Tùng said the university had been searching for land and investment to relocate to suburban areas. Tùng said if they relied entirely on tuition fees, the university wouldn’t have enough money to invest in a relocation project. Trần Xuân Nhĩ, former vice minister of Education and Training told Tiền phong (Vanguard) newspaper that few people wanted to leave city centre. University managers were not willing to change while students liked crowded areas to easily get a part-time job. “The policy to move universities out of the city centre areas is right but the policy implementation is slow because of insufficient directions and mechanisms,” Nhĩ said. When a university is moved to another place, various issues should be taken into account for examples, housing for staff and students and transportation to the city centre. “Universities must have detailed roadmaps and the Government must ensure proper funding,” he said. In the case of autonomous universities, the Government should offer incentive loans so they could have enough financial capacity to relocate, Nhĩ added. Nghiêm from Hà Nội Urban Planning and Development Association said when it came to a university project, facilities for learning were not the only issue, but housing for teachers and students was important too.